thINK 2017. Canon Solutions America Users Attend the Third Annual thINK Conference. thINK is a self-governed and growing community of more than 400 members in relation to Canon Solutions America’s production print customers. The community provides a forum for members to network, gain knowledge, discuss common challenges, and share best practices for production inkjet printing. For the third consecutive year, the organization held its user conference to focus on innovation, customer experience, and world-class education. Production inkjet customers, solution partners, and print industry experts totaling over 570 attendees gathered in Boca Raton, FL from October 9 to 11, 2017 at the Boca Raton Resort & Club, a Waldorf Astoria Resort. Supported by Canon Solutions America, thINK builds upon available resources to provide members with inkjet tools, videos, market research, and white papers to meet the evolving needs of the growing inkjet community. Above: For the third consecutive year, Canon Solutions America’s production inkjet customers, solution partners, and print industry experts gathered in Boca Raton, FL for the thINK Conference. The third thINK conference took off with a welcome note from Victor Bohnert, executive director, thINK; Francis A. McMahon, SVP, marketing and sales operations, Canon Solutions America; Mark DeBoer, president, thINK; Eric Hawkinson, senior director, marketing, Canon Solutions America, and Christian Unterberger, chief marketing office/EVP, Océ—A Canon Company. During the welcome note, Unterberger discussed the Canon Voyager, which is scheduled for release in 2018. The Voyager features print speeds of 3,000 sheets per hour (sph) in 30×22-inch simplex mode and 18,000 sph letter sizes six and up. It’s designed to be paper agnostic—referring to versatile media compatibility. Designed for the high-end commercial and photo application markets, it features duplex printing and seven colors. During the welcome note, Mal Baboyian, EVP, large format solutions/production print solutions, Canon Solutions America, who is retiring after over 40 years in the industry, was recognized for his contribution to the company. Spanning three days, the conference featured three keynote speakers, including Captain Mark Kelly, commander of the space shuttle Endeavour’s final mission, space and aviation contributor, NBC News/MSNBC; Greg McKeown, CEO, THIS Inc., and James “Jim” P. Cochrane, CCMO, USPS. Kelly concluded the welcoming note by sharing his life experiences and demonstrating how focus, dedication, and persistence can help attendees find potential to succeed in any competitive setting. He discussed life lessons from his experiences in the navy, outer space, as well as the recovery and resilience of his wife, Gabrielle Giffords, a former AZ congresswoman. thINK provided attendees with Klik bracelets for networking. Sponsored by International Paper, thINK attendees bumped Klik bracelets with one another to instantly exchange contact information and earn points for prizes. Points were given for connecting, attending sessions, and visiting partner booths. Additionally, the event featured a Partner Pavilion, hosting booths from thINK sponsors including Appleton Coated, Appvion, Arcis Solutions, BCC Software, C.P. Bourg, Crawford Technologies, Crown Van Gelder, Dalim Software, Domtar, Double A, Duplo, EMT International, Epic Products International, Glatfelter, Georgia Pacific, Harris & Bruno, International Paper, Ironsides Technology, Lindenmeyr Munroe, MBO America, Messagepoint, Midland Paper, MindFire, Mitsubishi Imaging (MBM), Inc., mondi, Muller Martini, OneVision, Quadient, Racami, Rochester Software Associates, Sefas, Solimar Systems, Standard, Tecnau, Trekk, Ultimate TechnoGraphics, Verso, and Videk. The event offered 25 educational sessions designed for all levels of inkjet experience. Over 50 speakers presented on topics including color profiling, continuous feed inkjet, customer management, finishing, G7 calibration, high-speed inkjet, inkjet workflows, marketing, production efficiencies, and sheet-fed inkjet. During Cochrane’s closing keynote, Attention at the Convergence of Physical and Digital, he introduced the USPS’ newest consumer-facing feature, Informed Delivery. Informed Delivery provides users with digital previews of their household mail arriving soon including mail piece, representative images, and supplemental content like URLs. At this time Cochrane also discussed the direct mail market, revealing a 150 percent increase in direct mail sales by adding texture and that 86 percent of consumers admit personalization plays a role in decision making. McKeown concluded the closing note by discussing his bestselling book, Essentialism: The Disciplined Pursuit of Less. McKeown suggested attendees consider how spending 80 percent of time on the vital few rather than the trivial can affect business as well as personal goals. His clients include Airbnb, Apple, Google, Facebook, and Pixar. The conference wrapped up with Canon Customer Experience Center tours, which featured demonstrations of the Océ ProStream 1000. The Océ ProStream 1000 features a maximum print speed of 262 square feet per hour at 22 inches wide. It uses Canon ColorGrip technology and pigment based polymer ink with a high-capacity duty cycle up to 35 million A4 pages per month. ColorGrip enhances image quality on papers not designed for inkjet. The third annual thINK conference experienced a 25 percent increase in overall attendance compared to thINK 2016. 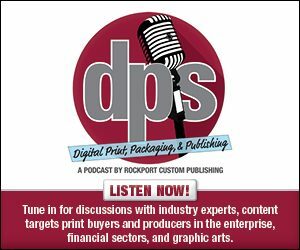 As production inkjet technologies continue to advance, thINK helps its members feel a sense of community and succeed through education and networking.